SCOTLAND — Things were looking pretty good for the Bellwood-Antis baseball team as its PIAA Class 2A quarterfinal game vs. Camp Hill moved into the bottom of the third inning. The Blue Devils led 2-0, having snapped the Lions’ 21-inning scoreless streak in the playoffs in the top of the first inning. But that bottom of the third was a rough one for Bellwood. 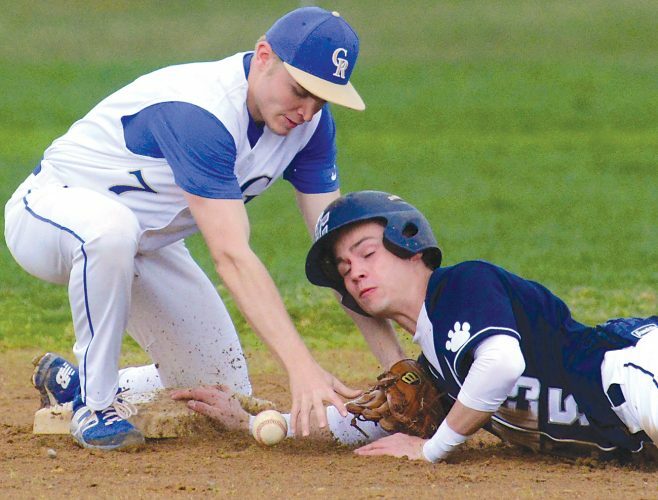 Camp Hill scored five runs – none of which came via a base hit – and went on to take a 7-2 victory Thursday afternoon at Greene Township Park. The Lions (16-8) will face the winner of Friday’s game between Schuylkill Haven and Neumann-Goretti in the semifinals Monday, while B-A bows out with a 19-5 record. Bellwood broke on top 2-0 in the top of the first. Ian McFarland jumped on the first pitch from Josh Goodyear for a hit, Trent Walker followed with a hit and both runners moved up on an error. After two outs, Troy Walker drew a base on balls to load ’em up, and two runs scored on Trentin Whaley’s clutch single to left. B-A lost a chance for another run when Troy Walker was caught in a rundown. He tried to score from second on a wild pitch, but slipped and couldn’t get back to third. The Blue Devils also left the bases loaded in the second inning. From that point on, Bellwood had only one other hit. In the Lions’ five run rally in the third, runs scored on a wild pitch, a sacrifice fly (at the end of a 10-pitch at-bat by Luke Newman), consecutive hit batters with the bases loaded and a walk with the bags full. BELLWOOD-ANTIS (2): McFarland 2b 411, Tre.Walker cf 311, Luensmann 3b 300, Showalter c 300, Shedlock cr 000, Tro.Walker 1b 200, Whaley rf 301, Stewart p 100, Nagle p 100, Plank dh 301, Kost lf 000, Schmoke ss 201. Totals–25-2-5. CAMP HILL (7): Buffington cf 211, J.Goodyear p 411, Newman 3b 200, L.Goodyear rf 221, Fellinger lf 410, Thompson c 401, Snyder cr 010, Gavlick ss 411, Myers dh 202, Ebel 2b 000, Foster 1b 200. Totals 26-7-7. E–Tro.Walker; Fellinger. DP–CH 1. 2B–Myers. RBI–Whaley 2; Buffington, Newman, Thompson, Gavlick, Myers, Foster. SF–Newman. SB–Buffington, J.Goodyear, L.Goodyear. PITCHING: Bellwood-Antis: Stewart (L,6-2)–2.2 IP, 4H, 2K, 1BB, 5R, 3ER; Nagle 3.1 IP, 3H, 1K, 3BB, 2R, 2 ER. Camp Hill: J.Goodyear (W,4-1)–5IP, 4H, 6K, 6BB, 2R, 2ER; Myers 2IP, 1H, 2K, 0BB, 0R, 0ER. HBP–Stewart 3; Myers. WP–Stewart 3; J.Goodyear 1. Records: Bellwood-Antis (19-5(; Camp Hill (16-8).